Spending time on Twitter is one of the most contagious things you will find on the web. Sending tweets back and forth is an activity over 250 million people are currently enjoying. It is well known that a reputation on Twitter comes with consistent and sustainable tweeting of great content. Let me therefore introduce you to a new app, that will help you to achieve exactly that. It is called Buffer and it will help you to tweet consistently day in day out. With Buffer all you do is put a few tweets into your Buffer, say for example in theÂ morning. The app schedules these tweets for your, well spread out over the day. That’s it. Once you created your account you can choose fixed tweeting times, your added tweets go out. You can add additional timeslots for higher frequency and spread them out evenly over the day. For every day, your buffered tweets will go out to your followers at these times. Each at a time. Set your fixed daily tweeting times. What makes using Buffer even simpler is using one of the browser extensions. 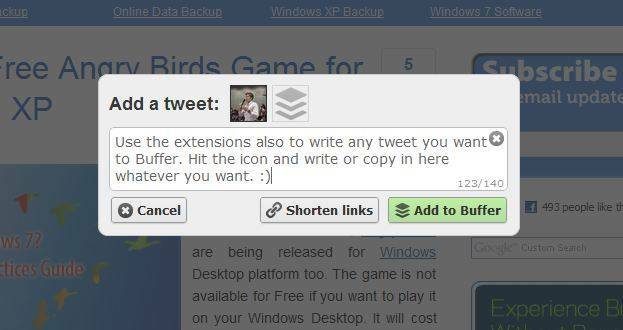 You can then add tweets to your Buffer right there from any page you are on. Whenever you like an article, click the Buffer icon and add one more tweet to your Buffer. What is really convenient, is that Buffer, by default suggest you the title of the page and a shortened link. I have done this with Samerâ€™s post below. Add tweets into your Buffer from any page you are on. 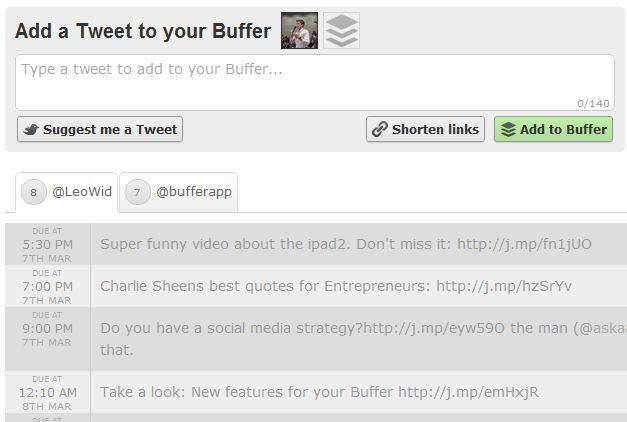 With Buffer you will also be able to add from whichever page you are on, without wanting to tweet about this exact page. This happens by putting whatever you want to tweet about into your panel. After that simply hit â€œAdd to Bufferâ€ to put it in. Or add ANY tweet to your Buffer. Once you inserted a few tweets to your Buffer you can always go back to your Buffer account and edit the tweets. Move them around intuitively with drag and drop, edit them or delete some you donâ€™t think are worthy to be tweeted. Finally you can track the impact of your Buffered tweets with an analytics feature. Seeing the number of retweets will help you to understand what content is interesting to your followers and what isn’t. See the impact of your tweets. What will I achieve with Buffer? If you are a person like me, reading many great blogposts every day and trying to fully capitalize on traffic from Twitter, Buffer is a must have for your toolkit. What makes Buffer a â€œkillerâ€ tool, is that it means no extra effort to add a tweet whilst reading, yet you share great articles with your followers consistently. As with most products out there Buffer offers you a free and a paid version. On the free plan, you can put up to 10 tweets into your Buffer account. For 5$ a month you can get 3 different Twitter accounts and up to 150 tweets stored in your Buffer. You can also add your bit.ly details and add teammembers to collaborate on one Twitter account on the paid plan. Try out Buffer and let me know your views below.